From Jaws (1975) to The Post (2017), Steven Spielberg’s legacy is hit parade. Well, here’s another one. Ready Player One is Spielberg’s most technically ambitious effort since The Adventures of Tintin. It’s is a CG-live action combo that keeps the two worlds separate but constantly informing one another. But beyond his technical achievements and storytelling skill, there’s a reliable “how good is my Spielberg?” measure: does the music/ visuals combo hit a sweet spot that gives you goosebumps? If it does, the Spielberg can be considered a success. Spielberg has hit that note often in his long career and he does it again in Ready Player One. You’ll know it when you see it. 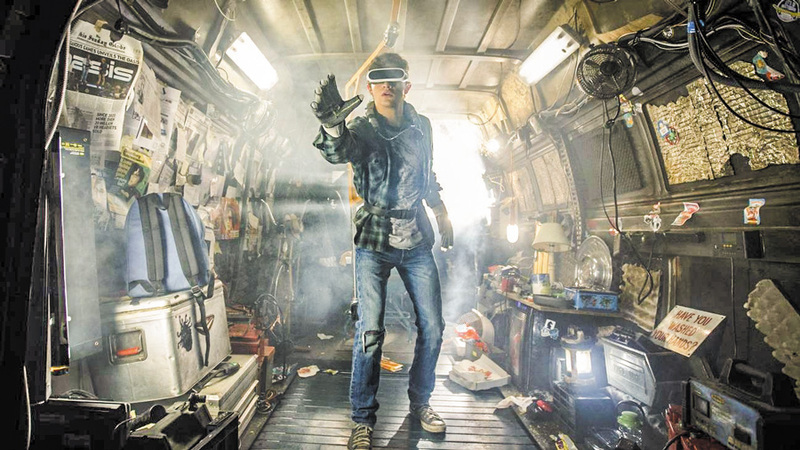 Based on the best seller by Ernest Cline (who also wrote the screenplay), Ready Player One takes place in 2045 (I’d call it a dystopic future, but 27 years feels too close for comfort). The world is overpopulated, resources are dwindling and most people live in poverty. In these dire conditions, humanity’s escapism is the Oasis, a vast, virtual-reality universe that’s accessible to everyone. Within the VR cosmos is an Easter Egg hunt called “Anorak’s Quest”. There are three MacGuffins in the form of keys buried in different corners of the universe that will give the player who collects them control of the Oasis. When Wade Watts (Tye Sheridan X-Men: Apocalypse), a teen with a vast knowledge of 80s pop culture, finds the first key, it triggers the interest of IOI, a soulless tech conglomerate that wants to take over the Oasis and profit from it. It’s the beginning of a race that pits feisty teenagers against corporate greed (see also: Students vs. the NRA). There’s a lot of story crammed into 140 minutes, some of it artfully, some not. But Ready Player One is not really about gaming and trivia (if you’re into that, check out the source material). As with The Post and Bridge of Spies, Spielberg asks us to distrust authority by making authority villainous. IOI is practically a paramilitary organization that forces its debtors into indentured servitude, so naturally, they cheat and try to win the game by throwing money at it. It’s interesting to see America’s foremost filmmaker so critical of modern capitalism. Ready Player One also warns about the risks of losing oneself in a fake world (gaming, television, you name it) to avoid the flawed real one. With his trademark earnestness, Spielberg points out the real adventure is outside your house. Recent events worldwide have proven him right. Ready Player One’s style is for the ages. The visuals are exuberant and overwhelming, and I loved every minute of it. The detail demands a second or third viewing, while the “camera” use in a free-flowing, physics-defying CG environment is striking. It could have used some John Williams. But then again, couldn’t every movie? This movie isn’t perfect. The virtual romance between Wade and budding insurgent Art3mis (Olivia Cooke, Me and Earl and the Dying Girl) is flat, and Mark Rylance’s work as Oasis creator James Halliday is so strong that the rest of the performances — including work by highly legitimate actors Simon Pegg and Ben Mendelsohn — pales in comparison. But who cares? The joy of a Spielberg film that’s pure fun in the vein of Jurassic Park and Indiana Jones far outweighs any qualms.